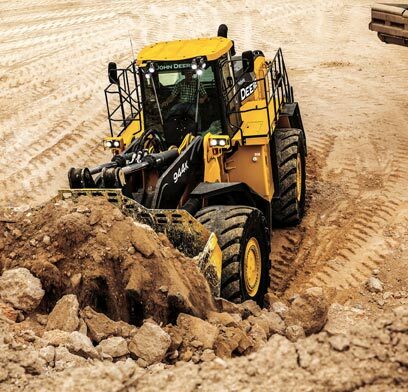 The John Deere 944K Hybrid Wheel Loader is bolstering bottom lines by offering maximized productivity and efficiency through its hybrid-electric drive system designed to lower daily operating costs. Coupled with a 536 horsepower, PowerTech EPA Interim Tier 4 engine (IT4), the 944K Hybrid Wheel Loader can provide significant fuel savings over 9-yard3 loaders with conventional drivetrains*. The production-class wheel loader’s brushless AC generators and motors, water-cooled brake resistors and solid-state power electronics deliver reliable, long-term performance to quarry and large-load applications. “Today’s wheel loaders demand increased uptime and reliability, and our customers asked for a solution that offers much more,” said John Chesterman, product marketing manager, production class four-wheel drive loaders, John Deere Construction & Forestry. “The highly fuel-efficient 944K Hybrid Wheel Loader delivers quick, smooth and responsive hydraulics, and four modular, independent wheel drives with electronic traction control that provide customers with a complete loader solution built to last through the most rugged conditions.” The 944K’s hybrid-electric drive recaptures energy while slowing the loader when the operator lets off the accelerator, lessening the load on the engine and further reducing fuel consumption. During operation, the engine can run in a limited speed range of 1,200 – 1,800 rpm for maximum fuel efficiency in Normal Mode or can run at constant speed so boom and bucket functions are powerful, responsive and quick in Performance Mode. Offering strong pushing power and quick ramp-climbing ability, the 944K hybrid wheel loader helps operators maintain stockpiles and heap hoppers in quarry operations and other production facilities through its bucket width of 12 feet and breakout force of 103,388 pounds. No transmission shifting or clutches to engage enable smooth reversals and less spillage. The 944K Hybrid Wheel Loader offers standard traction control that automatically limits torque to any wheel when slippage occurs, increasing machine traction in poor underfoot conditions. With enhanced rim pull control, the loader prevents tire spin and slicing. The 944K also offers coast control to reduce service-brake wear and features such functions as dynamic braking in a hydrostatic transmission, slowing the loader and helping reduce service-brake component wear. Inside the cab, the loader is quieter than other machines on the market. At only 108 decibels, noise is much less noticeable to bystanders, and cab noise is only 72 decibels for the operator. With the largest loader cab offered by Deere, the 944K offers a commanding view to the bucket, tires and ground hazards through floor-to-ceiling front glass. The machine’s joystick steering delivers smooth, low-effort control for fatigue-beating comfort. Customers looking to get the most out of their 944K Hybrid Wheel Loader can rely on their John Deere dealers to provide Ultimate Uptime featuring John Deere WorkSight. With Ultimate Uptime, owners receive pre-delivery and follow-up inspections; five years of JDLink Ultimate telematics, machine health prognostics and remote diagnostics, and programming capability; and the ability to add dealer-provided uptime solutions to customize the package to individual needs. *Actual fuel consumption rates and savings will vary with machine application, utilization, operator, and model of competitive unit.